Summary and Definition: The semi-nomadic Cayuse tribe were fishers, hunter-gatherers and traders of the Plateau cultural group. The Cayuse lived in parts of present-day Washington and Oregon. The Cayuse came into conflict with the white settlers when the Oregon Trail was opened. They fought against the US in the Yakima War (1855-1858) and in the Cayuse War 1847–1855 led by Chief Five Crows. What was the lifestyle and culture of the Cayuse tribe? The Cayuse tribe were one of the most numerous and powerful tribes of the Plateau Culture area. They lived a semi-nomadic lifestyle fishing, hunting, or gathering wild plants for food. The Cayuse were given the name by French-Canadian fur traders, who called them Cailloux, meaning "Rock People," because of the rocky environment of parts of their homeland. The introduction of the horse in the 1700's brought about a change in lifestyle and many of the Cayuse people traveled to the Great Plains to hunt buffalo. They adopted some of the ideas of the Great Plains native American Indians including the use of the tepee which were covered with buffalo hides and some items of clothing made from buffalo hides. The grasslands of the Cayuse territory enabled the tribe to become horse breeders and traders and bred the Cayuse horse breed. Who were the allies and enemies of the Cayuse tribe? The allies of the Cayuse tribe were many of the other Native American Indians who inhabited the Plateau region including the Perce Nez, Walla Walla, Spokane, Coeur D'Alene, Yakama and Palouse tribes. The main enemies of the Cayuse tribe were the Great Basin groups to the south, including the Shoshone and Northern Paiute. Where did the Cayuse tribe live? The Cayuse are people of the Plateau Native American cultural group whose territories covered hundreds of miles across Northeast Oregon and Southeast Washington. The geography of the region in which they lived dictated the lifestyle and culture of the Cayuse tribe. The Cayuse territory extended from the mountains eastward to John Day River across the Blue Mountains to the Grande Ronde. What did the Cayuse tribe live in? The Cayuse were semi-nomadic and needed shelters that were easy to erect and take down. The Cayuse lived in one of three shelters, depending on the season. The types of shelters were a semi-subterranean pit house, a tepee or a tule-mat lodge. Pit houses were shelters that were built with logs and sealed for insulation with dirt and grasses. Pit houses were built below ground with an entrance and ladder at the top and were generally used during the cold, winter months. The summer shelters were above ground: the tepee and tule-mat lodge. Tepees were covered with animal skins but the tule-mat lodge was covered with mats of strong, durable, tule reeds (bulrushes). What language did the Cayuse tribe speak? The Cayuse tribe spoke in their own language unlike the Sahaptian dialect spoken by the neighboring Plateau Native Indian group. They call themselves 'Nimiipu', which means "the people". What food did the Cayuse tribe eat? The food that the Cayuse tribe ate included salmon and other fish and a variety of meats from the animals that they hunted. About half their diet was fish, and the other half came from large game animals and small birds. They supplemented their protein diet with seeds, roots, nuts and fruits. What weapons did the Cayuse use? The weapons used by the Cayuse were spears, knives, bows and arrows and clubs. The Cayuse also used shields for defensive purposes. What clothes did the Cayuse men wear? Originally Cayuse clothes were made of shredded cedar bark, deerskin, or rabbit skin. However with the influence of the Great plains tribes they began to use buffalo hides to make their clothes. The clothes worn by the men varied according to the season but generally they wore breechcloths and leggings, shirts, moccasins and robes. Blankets and gloves were frequently used to keep out the cold. It was customary to decorate their clothes with fringes. Breastplates were worn for decoration purposes as were armbands, wristbands and anklets. Headdresses were made of feathers, some used a 'standup' design of headdresses others were magnificent feather headdresses that trailed to the floor. The Cayuse horseman wears a halo style headdress with bison horns. Their hair was kept long and decorated with beads and plaits for special occasions. What clothes did the Cayuse women wear? The women of the Cayuse tribe wore long dresses that covered them from the neck to their ankles. The women also wore knee length moccasins during the winter. Cayuse Clothes were decorated with beads made from a variety of materials that included shells, pebbles, claws, bones, nuts, seeds, porcupine quills, horns, pieces of metal and bird talons. What was the religion and beliefs of the Cayuse tribe? The religion and beliefs of the Cayuse tribe was based on Animism that encompassed the spiritual or religious idea that the universe and all natural objects animals, plants, trees, rivers, mountains rocks etc have souls or spirits. Who were the most famous leaders and chiefs of the Cayuse tribe? 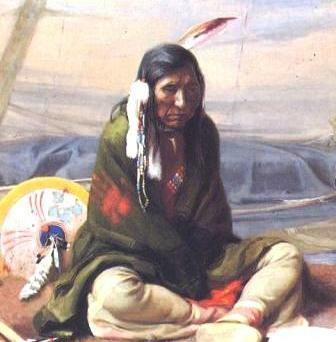 The most famous leaders and chiefs of the Cayuse tribe included Chief Egan. Cayuse History Timeline: What happened to the Cayuse tribe? The following Cayuse history timeline details facts, dates and famous landmarks and battles fought by the Cayuse Nation. The Cayuse history timeline explains what happened to the people of their tribe. 1855: In the Walla Walla Treaty the Cayuse, Umatilla, and Walla Walla agreed to cede 4,012,800 acres of land in return for $150,000, the creation of a 512,000-acre reservation and the retention of traditional hunting and fishing rights. For additional facts and information refer to the legend and the Story of Chief Egan.